Business opportunities in Dubai are available on different levels for professionals and entrepreneurs of every field. There is lot of space in Dubai mainland to set up business of almost any type. But if you want to retain 100% shares of your company (an Emirati sponsor will hold 51% shares of a foreign company in Dubai mainland) then there is no shortage of free zone areas in the city. There are around 45 free trade zone areas in UAE and more than half of such free zones are present in Dubai alone. Most of these free zones allow specific type of business opportunity and mostly they are named according to the business opportunity they provide. One such specific free zone in Dubai is the Dubai Design District (d3). Dubai Design District provides amazing commercial opportunities for businesses related to design community. The specific free zone is appropriate not only for established companies but also for startups who want to excel in the design field. Several international luxury and fashion brands have their businesses in d3. So far, only one phase of the Dubai Design District has completed and the work is in progress for the next two phases of d3. After its completion in 2019, d3 will become hub of design and fashion in Dubai. The under construction phases of d3 provide favorable opportunity for those who want to start their design and fashion business with little investment. The space in d3 is currently available at very reasonable rates and one can book place for setting up his/her business later. Opening a business in the current stage is helpful to achieve popularity before emergence of stiff competition. There are great chances of growth of d3 in future due to its location. It is placed beside Dubai Creek and behind the Dubai Mall and Burj Khalifa. D3 is also taking other measures for growth of business opportunities in the free zone. One such step is the organization of Dubai Design Week. Currently, the 3rd edition of the design week is underway that is attended by thousands of visitors from all around the world. Despite being constructed mainly for design, fashion and luxury industry, the business opportunities in Dubai Design District are not limited to these sectors. Like most of the other free zones in Dubai, d3 is also designed to accommodate other industries also. The space is also available for other businesses including retail outlets, food and beverages, hotels and others. 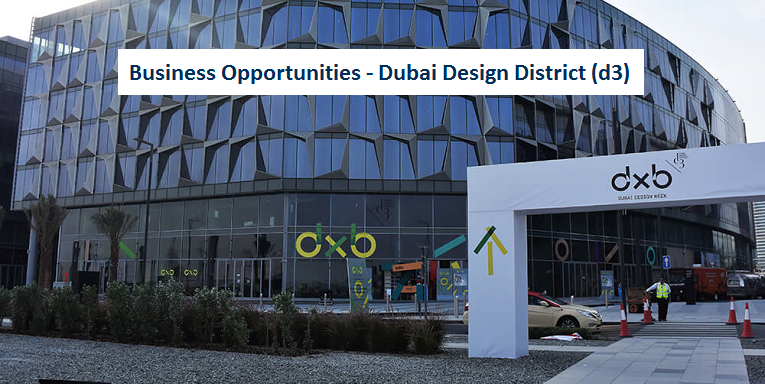 Not only that there are tremendous opportunities available for establishment of businesses in Dubai Design District but there are immense chances of growth for d3 in future also. Due to less competition, it is the best time to start your business in d3. If you are related to fashion or design industry then d3 is the best location to fulfill your business plans. In case you are planning to open your business in Dubai Design District then we at Riz & Mona Consultancy are here to assist you in smooth and reliable formation of your desired company in d3. You can contact us via our WhatsApp # 971-56-9971225. I would like open a fashion design company. I currently work at Fashion Design Dubai. Is it possible for me to start a business.? Thank you Caroline for your interest in company formation with us. Yes, you can definitely open fashion design company in Dubai. Kindly send us your requirement at info @ rizmona.com or message us at WhatsApp: +971 56 9971225. We would love to discuss your idea in detail.